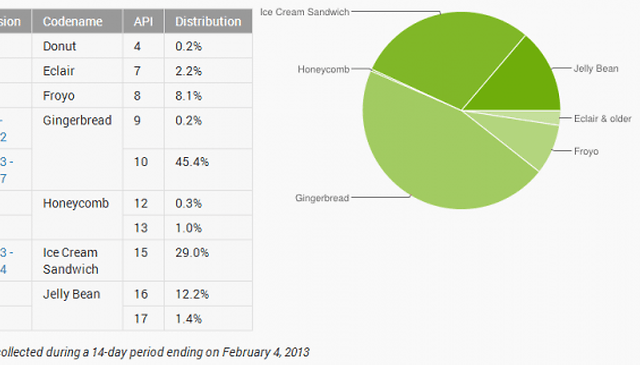 The numbers are out and Android 4.1 Jelly Bean's share is growing, but slowly. Many of the people who originally bought Gingerbread phones should see an update to Android 4.1 sometime this year, while the majority of new phones on sale right now also feature Android Jelly Bean. For developers, the picture is still a bit hazy. Do you focus on developing for the newest OS, or do you focus on developing for Gingerbread, still the dominant platform? All of this is further complicated by the fact that soon Jelly Bean will be soon be replaced by Key Lime Pie next month. Android fragmentation is a problem for everyone, including manufacturers, carriers, customers and, of course, Google. Sometimes it's incredibly hard to update a phone after you've had it for a year or so. Other times, rooting and installing a custom ROM is a piece of cake. It all depends on how common your model is and how easy it is to unlock your phone's bootloader. But if you stick with AndroidPIT, we can teach you how to get the most out of your phone, no matter which model you own.